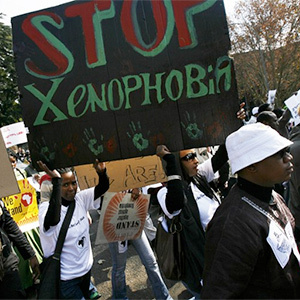 Pretoria, South Africa – South Africa must act decisively in response to xenophobia and attacks on foreigners, but solutions must be based on unity and cohesion, not more segregation, according to the Institute for Security Studies (ISS). Thousands of foreigners have been displaced and five killed in the latest attacks that started in KwaZulu-Natal last week. The negative attitudes of many South Africans toward foreigners remain unchanged since the incidents earlier this year and in 2008 when 62 foreigners were murdered. Both notions have been disproved by research, said Newham. Using data from Statistics South Africa, a study by the Migrating for Work Research Consortium showed that in 2014 just 4% of the working population was made up of foreigners. Research by the Gauteng City-Region Observatory showed that rather than causing unemployment, international migrants contribute to the economy by renting shops from South Africans, providing jobs to locals and paying value added tax. Foreigners that run businesses employ more South Africans than South African-run businesses do. And while some foreign nationals engage in crime, most do not. South Africans perpetrate a vast majority of crime in the country. This is acknowledged in Statistics South Africa’s National Victims of Crime Survey released in 2014 which shows that 95% of the 30 000 households surveyed said crime in their area was committed by South Africans. Only 5% said that crime in their area was caused by foreigners. But given the lessons learned from its racially divided past and the values enshrined in the country’s Constitution, it is legitimate to expect better of South Africa on this score. ‘Government does not seem to have learned from the past’ said Tamukamoyo. ‘Xenophobia is becoming a barometer of dissatisfaction for the lack of service delivery and jobs. Frustrated South Africans are picking on soft targets’. According to Newham, the country is heading dangerously close to introducing a new form of apartheid where foreign nationals are segregated from local communities and are subject to second-class treatment. Four interventions could help South Africa avoid such a shameful scenario from occurring. First, the country’s leadership – from the highest level to the local level – must speak in a unified voice to dispel the myths about foreign nationals. Second, the state’s intelligence agencies must direct their efforts to better understanding the dynamics behind the violent attacks, to better predict where they may occur and to what extent they are organised. Third, there must be no impunity for those who attack foreign nationals and steal their belongings. Rather than turning a blind eye, the police must gather evidence against all those who commit crimes, and make arrests where appropriate. Fourth, foreign nationals must be seen as a valuable resource and integrated into economic growth plans rather than being excluded from them. This will also require a review of immigration policy and practice.